Prickly planting to deter thieves. Following a burglary of our equipment in January. We got to thinking about extra security and finally settled on a lock up away from our premises. However, we then moved onto comtemplating on how nature can provide it's own defence and therefore compiled this list of 6 plants (there are many more!) that could help protect your home. Thieves are always looking for the easiest and quickest way into your house and a prickly brush maybe enough to make them think twice about breaking in or be enough to prevent them from gaining access. We wouldn't suggest using them to replace your existing security- such as alarms, CCTV and flood lights, but they would be good to be used alongside these. Don't feel you have to sacrifice your garden in order to provide protection- a lot of the plants below will also add colour, provide food and homes for garden wildlife as well as adding some texture and variety. An attractive shrub with a dense thorny structure. Produces small white flowers, followed by red and orange berries. Ultimate height: 2.5 metres. Perfect for impenetrable hedging. Good shrub for wildlife- providing cover for nesting birds, berries for food and summer flowers for bees. Easy to grow native shrub - thorny with dark bark. 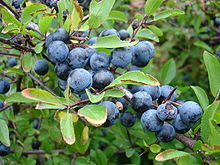 Produces a black/blue fruit - 'sloe'. Ultimate height is less than 4 metres. Dark green foliage in Autumn, Spring and Summer and white flowers in Spring. 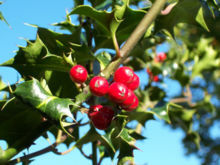 Evergreen shrub -dark and glossy, strong spiny leaves. White flowers in Spring and Summer. Female plants only have red berries. Can grow to 12 metres! Easy to grow in a well-drained soil in a sunny position. A large evergreen bushy shrub or small tree. 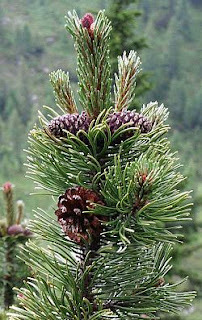 Dark green needle-like leaves and dark brown cones. Can grow in any well-drained soil. Ultimate height - 1 metre. Compact, small shrub- deciduous or semi-evergreen. Thorny stems bearing small pink flowers. Easy to grow- prefers full sun. Bushy deciduous shrub with rich purple foliage and thorny stems. Small red and yellow flowers are followed by berries in Autumn. Ultimate height - 1.5 metres. We would recommend visiting your local garden centre as there you will be able to see what you are buying 'in the flesh' rather than try to gauge the size from a picture on the Internet. Your local garden centre can also provide advice about suitable plants for this purpose and you could also contact your local gardener who can source appropriate plants as well as discussing positioning and suitability to your current soil. If you are currently planning to re-landscape your garden, it may also be worth adding plants with thorns or spiky leaves to the design for under windows and next to drainpipes.